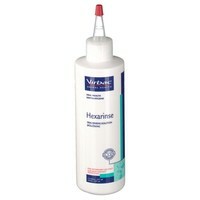 Hexarinse Oral Rinsing Solution is a soothing, refreshing and palatable rinse for dogs and cats. Hexarinse contains chlorhexidine gluconate. The antimicrobial activity of chlorhexidine can aid in the prevention of tooth and gum disease. Hexarinse prevents plaque, bad breath and gum disease and temporarily relieves of minor gum irritations. In Clinic: Before during and after de-scaling. At Home: Rinse daily following each meal or as directed by your veterinary surgeon.